Superman speaks to the "Superman Squad," who he encountered at the end of last issue. The Superman Squad is from the future. Superman has not been himself recently, and the Superman Squad wants to show him why. The squad steps through a portal, and Superman follows along. They head to the "Fortress of Solidarity"; the antithesis of the Fortress of Solitude, where these super people go to find companionship with others just like them. We are told that the Fortress of Solidarity exists outside of space and time, in a region that some call "the Still Zone". Superman explains that he has already heard of the Superman Squad, a large group of Supermen from various eras who have banded together to defend the time stream. With the red-cowled woman acting as guide, Superman is given a short tour of this strange and wondrous place; and is introduced to a few of the inhabitants. Superman is shown more portals, which serve as windows for viewing all events in space-time. The young woman discusses Superman's recent bouts of cynicism and moral confusion, and his current crisis of confidence. She gives a quick synopsis of the events of New Krypton and its aftermath; and explains that these events have triggered a severe case of depression and self-doubt in the Man of Steel, and in fact a complete emotional breakdown. She indicates that an external influence has reinforced the depression; but that she cannot reveal more without risking a time paradox. Superman is told that if left unchecked, the depression and doubt would erase everything that defines him. As a remedy, Superman is told that he must consider whether or not it is important to have Superman in the universe. His answer might dictate whether the Superman Squad lives on, and whether Superman's legacy will persevere. 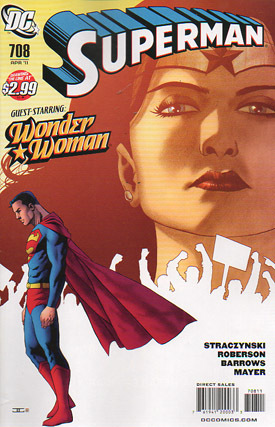 Superman is dropped off in Lincoln, Nebraska, and told that history shows that he will soon encounter a particular woman, who will be inspired by his actions. Superman is very curious as to the identity of this woman. He is still wallowing in doubt and uncertainty when a school bus loses control on an elevated highway due to the rainstorm and crashes through the safety barrier. The bus is headed for disaster when Superman catches it and reassures the kids onboard. Wonder Woman is nearby and has been observing Superman's rescue. She seems to be truly inspired by his heroism and abilities. She decides to stay and watch him in action some more. The hard rain intensifies and causes flooding. Superman wants to get the people to safety, when a large tornado materializes. Suddenly Superman has his hands full. He cannot rescue folks from the flood without ignoring the threat of the twister. He spots Wonder Woman flying in his direction; and although he struggles to recognize her, he asks for her help in rescuing the flood victims. As Wonder Woman goes to work rescuing people from the floodwaters, she comes upon an evil and powerful young woman who slams Wonder Woman down hard and causes some pain. This appears to be science teacher Lisa Jennings, who was transformed when she held and looked through a mysterious crystal back in issue #703. Jennings and Wonder Woman exchange words and blows, until Wonder Woman has to leave the fray to rescue more people. She vows to return and finish the job. During her exchange with Wonder Woman, the renegade teacher reveals that she has been on a campaign to demoralize Superman. She intended to put him in a situation where he had to choose between rescuing the flood victims or stopping the tornado. Either choice would cause death of innocent victims, and cause Superman to doubt himself further. But Wonder Woman's involvement prevented this lose-lose scenario. Jennings explains that Wonder Woman ruined her sinister plan, which is why she attacked Wonder Woman so viciously. Superman eliminates the tornado threat, and then heads back to trade notes with Wonder Woman. Before leaving, Wonder Woman warns Superman that Lisa Jennings is plotting to sabotage him. Story - 4: There was much to like in this interesting, diverse story. The plot really was all over the map; from an encounter with heroes from the future, to visiting a meeting place for Superman-inspired heroes that exists outside of normal space and time, to fighting weather disasters in Lincoln, Nebraska, to meeting the "new" Wonder Woman. It all flowed together rather well. I have always liked Wonder Woman, and was very happy to see her cameo in this book. But her appearance raised some interesting questions. Primarily, it was noteworthy that Superman did not recognize her. "That woman -- that flying woman -- she seems so... familiar. But how? Certainly, I'd remember if we'd met before." Those words are amusing and very ironic, since Superman and Wonder Woman have battled side-by-side so many times in the past, and are known in the DC Universe to be very close friends. So I did a little digging, to see if I could get a better explanation of why Superman did not seem to know her. I went to the DC database, to see what I could find out there. They confirmed what I suspected; that the recent changes affecting Wonder Woman were not merely cosmetic. Way more changed than just the costume. In fact, this qualified as a complete reboot. And in this version of canon, no one has ever heard of Wonder Woman. Even Wonder Woman does not know her own origin; or at least she did not when the reboot was initiated in Wonder Woman #600. I think this introduces some major logic flaws. Donna Troy is still very active over in Justice League, and is still part of the Wonder Woman family. But if nobody knows Wonder Woman anymore, shouldn't people be unaware of Donna Troy as well? Or shouldn't Donna at least need her own reboot? The same would apply to Cassie Sandsmark. Since this has not happened to Donna and Cassie, it leaves things in an awkward state, in my opinion. 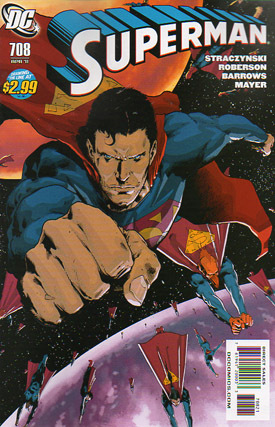 When Byrne rebooted Superman in the 1980s, the entire Superman family was part of the reboot. That makes more sense. In this issue, Wonder Woman has not become a superhero yet. That is clear when Lisa Jennings calls her a superhero and Wonder Woman is surprised. I really like that in this version, it is Superman's heroics that help inspire Wonder Woman to become a true superhero. I liked the school bus scene. It is perhaps a nod to the well-known school bus scene in Superman: The Movie. I liked that Superman used a novel way to disarm the tornado, by creating a sonic boom to help enervate the twister. Superman usually speeds in the opposite direction to cancel the tornado out; but I liked seeing this variation. It is good to finally know why Superman has been acting so strangely. But things are still unresolved. Since we have Lisa Jennings gloating in the last panel and vowing to keep the pressure on Superman, it is clear that things will continue to build to a resolution. That is good! We want Superman to get his full confidence back! Art - 5: I loved the Barrows artwork. There are some great images here, like the two-page spread at the Fortress of Solidarity. The action shots of Superman and Wonder Woman in Lincoln, Nebraska were all excellent. And I couldn't stop chuckling at the gorilla in the superhero costume. Cover Art - 5: I love this cover! Superman hanging his head, looking depressed; and in contrast, a great oversized image of Wonder Woman, looking purposeful and determined. Nicely drawn; and very representative of the story inside. Cover Art (Alternate Cover) - 3: We have Superman in flight in the vicinity of the Fortress of Solidarity. But he looks very angry, not depressed. Several of the other Superman-based heroes are flying in the background. This is a pretty good cover; but the original cover (non-variant) is my clear favorite.